This fall, November 8-12, 2010, I will be teaching an intensive five day master class at the Huntington Library in San Marino, California. This will be the first time I’ve taught this class, and hopefully it will be a great introduction to woodworking and the conservation of wood board books. I’m really excited about it and think it will be a lot of fun, as well as a lot of learning. The workshop fee is a very modest $650, and I’m estimating about $150 for materials and some basic woodworking tools. Please contact Justin Johnson ( jjohnson (at) huntington (dot) org) for an application, or if you have questions, please contact me. 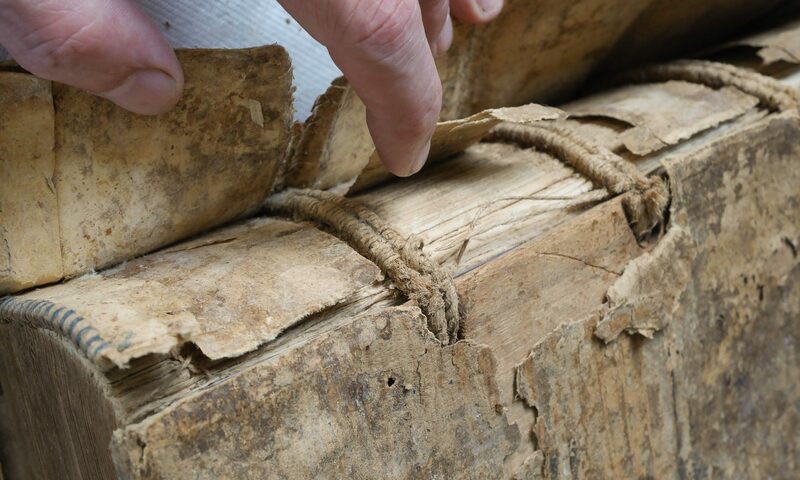 WOODEN BOOK BOARDS: THEIR CONSERVATION, HISTORIC CONSTRUCTION AND THE PRAXIS OF WORKING WOOD. This five day master class will focus on the fundamentals of wooden book boards: the basics of using hand tools to shape wood accurately, easily and efficiently; the making a sample set of wood to identify common historic varieties; the examining of historic techniques of shaping wood; and the making a sample set of common treatments for split boards. Choosing, tuning, using, sharpening and maintaining woodworking tools will also be taught. Exploring some of the complexities of wood technology and how this impacts treatment, storage and handling options for conservation treatments will also be covered. Participants are encouraged to bring documentation concerning specific split board treatment problems for class discussion. No previous woodworking experience is necessary. Bio: Jeffrey S. Peachey is the owner of a New York City-based studio for the conservation of books and the inventor of conservation tools and machines. He is a Professional Associate in the American Institute for Conservation. For more than 20 years, he has specialized in the conservation of books and paper artifacts for institutions and individuals. Learn how to evaluate, use and maintain basic hand wood working tools. Construct a sample set of reference wood commonly encountered in historic book boards. Construct a specialized jig to plane thin wood boards. Reproduce historic board shapes, channels, tunnels, chamfering and learn to recognize the tools used to make them. Construct samples of currently used techniques to repair split and splitting boards, and discuss their applicability in various real world situations. Make one sample board from a log, by hand, to understand the historic hand technologies– using a maul, froe, and broad axe. Begin to appreciate some of the complexities of wood technology and how this impacts treatment, storage and handling options for real world books. Consider storage, housing and display issues unique to wooden board bindings. Discuss specific potential treatment options from examples that participants supply. The registration fee for this 5-day workshop is $650.00. Other costs apply. Class size is limited to 10. For more information and to apply contact Justin Johnson at jjohnson (at) huntington (dot) org.